Quick Start — For the Impatient and Excited. Optionally: Pose (anywhere — or on the Wardrobe pose stand). Click the arrows on the button to switch between poses. It will tell you how to take, tag, and upload the snapshot. Click here for a more detailed description how to take snapshots. Open the Wardrobe web page . If you saved the snapshot to disk, drag it onto the web page and click "Import". Open the Wardrobe webpage or the rezzed closet and choose the outfit you want to wear. On the webpage, click the icon. Note that certain prerequisites must be met in order for you to be able to wear outfits from the website or the closet. Read this to find out how to prepare your inventory and viewer. The Wardrobe HUD is one of the essential parts of Wardrobe. 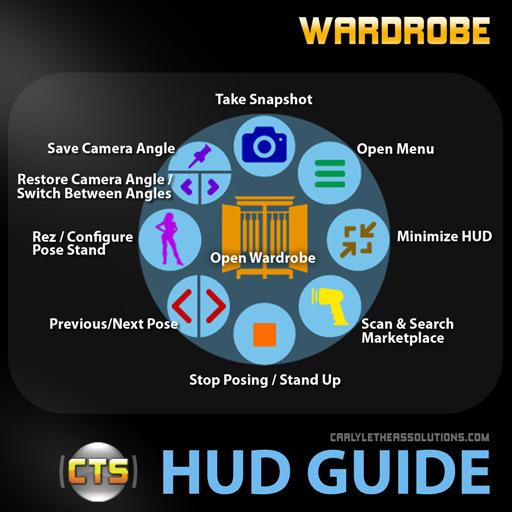 It is the gateway to online Wardrobe page and is also a posing HUD. Wear it. By default, it will attach to the bottom HUD attachment point. You can attach it to any HUD attachment point. Click here if you want to learn more about the HUD. Your personal Wardrobe webpage displays your outfits. Filter your outfits by tags: click a tag name in the left bar and only the outfits matching the tag will be displayed. Rate your outfits. Edit and delete items. You have already made snapshots of outfits before you had Wardrobe? Did the designer provide you with pictures of the outfit? No problem, on the website you can upload existing (full-perm) textures: simply drag the texture onto your HUD and follow the instructions to complete the uploading process, or on the web page, click Import > Import Texture (you'll need to get hold of the texture's UUID, which you can find and copy by right-clicking it in your SL inventory and selecting "Copy Asset UUID"). You can also upload pictures directly from your harddrive. Note that the image size is limited to 480x480 pixels. If your image is larger, it will be resized. Thumbnails have a resolution of 200x200 pixels. Wardrobe also comes with a mesh closet that you can rez in your bedroom. When you open its doors it will display the Wardrobe webpage inside. You can browse your outfits or show them to your friends. It works exactly as the usual Wardrobe web page, albeit not providing all the tools you have access to on the web page. You can choose from a set of closet textures either on your HUD (Menu > Setup > Closet Styles) or on your Wardrobe web page (Tools > Configure Closet > Closet Styles). In both cases, you'll need to stand near a rezzed closet to change the style. Rezzing the closet is optional. You don't need it in order to use Wardrobe. Special thanks to Cobalt27 (CobyDot Product). Using your HUD, you can rez a pose stand anywhere you can rez objects. Just click your HUD's button and a new pose stand will be rezzed. The Wardrobe pose stand features a backdrop that will open when you stand on the pose stand. You can select backdrop colors or textures on your HUD, or choose to hide it. You can also configure the posestand from your Wardrobe web page: Tools > Posestand Backdrops. This will be easier if you want to use a backdrop texture since the web page will display a catalogue of available backdrops to choose from (and you can even add your own!). Use the usual pose buttons on the HUD to switch between poses or stop posing. This way, the Wardrobe pose stand becomes a handy miniature photo studio.